MTN decided to offer all cheap data plans for browsing and also free and cheap call tariff plans for making free calls. Since last week and this week it has been all about new data and tariff plans from all networks which MTN network is among doing their best. This particular one introduced today by MTN is a kind of offer that works better in all device and is not the type that keeps you awake when you suppose to be enjoying your sleep. Unlike The newly loaded Gigabyte MTN night data plans. Althoughh they plans works better and fast in browsers. 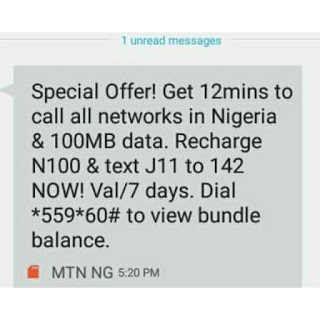 The message from MTN about the aforementioned offers for today is all about getting 12mins call +100MB with N100 only. And also getting 5mins to make call and as well 50MB for browsing. 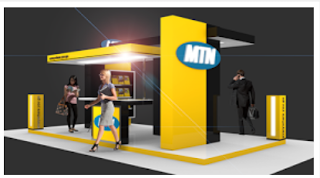 √ How To Get 500MB with Just N25 on MTN. Note, The call to make is not restricted to MTN numbers alone but it is extended to all networks in Nigeria. ==> Goto your message box with your phone and Text J11 to 142, after that MTN will send a confirmation message showing approval to that. ==>Then Send or Text J12 to 142 and MTN will reply with success message. The offers last for a day, it worth it because normal subscription per day from MTN is just 10MB with N100. But this one comes with 100MB with extra 12mins call for all networks. So there are much difference when you compare. Isn't it? For now the new offers are working on all sims, so its not selective in terms of using any MTN sim. Any question, use the comment box below. There is Love in sharing, use the share buttons below to make your friends feel happy and belong as well.